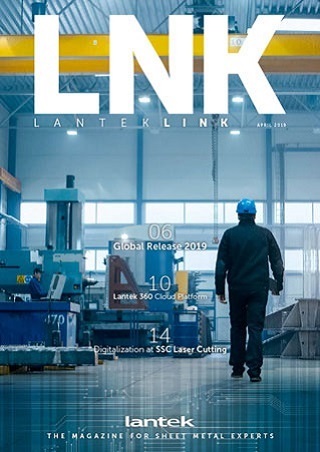 Lantek, a worldwide leader in the development and marketing of software solutions for the sheet metal and structural steel industry, has launched its new 2013 portfolio with significant innovations. These include ground breaking developments which result in more efficient nesting, punching, machining, and tube profile cutting. In addition, the new version provides solutions for controlling the simplest to the most sophisticated data in a manufacturing plant. Lantek´s products and services can be adapted to all types of sheet metal cutting and punching applications. One of the company´s distinguishing characteristics is that its solutions are universal and compatible with all makes of machine. Furthermore, they can be integrated into any company´s management system. The two main innovations that stand out in Lantek´s 2013 portfolio are its nesting solutions and intelligent integration mechanisms. The 2013 version of its CAD/CAM software provides revolutionary advances in the calculation of nests. The new system, based on state-of-the-art artificial intelligence ‘ThinkingMetal’ technology, incorporates powerful algorithms and mathematical morphology strategies which enable sheets to be optimised very easily, avoiding errors in the machining process and producing a significant reduction in wasted material as well as shorter production times. Industry specific features include nesting by areas, sheet turning, the ability to modify the cutting order, reordering of contours following hole destruction, cutting the line of remnant at the beginning of an area, and the rectangular cutting of the skeleton of the metal sheet. Furthermore, the software incorporates new logic for five-axis machines. Lantek has significantly improved the Lantek Flex3D solution for producing steel contours and pre-fabricated structures. It now incorporates an optimised work environment with total connectivity with all CAD and BIM software in the market. The new version of Lantek Flex3d includes a complete re-engineering of the machining engine, the nesting simulation, and the turret management. Lantek Flex3D solutions are at the forefront of 5-axis machining technology as they now allow the cutting vector to be inclined, the speed on corners for water jet cutters to be reduced, and the technology tables to be configured for the perfect adjustment of cutting parameters for each machine. For profile finishing, Lantek Flex3d now has new milling features and new parameters for checking the automatic drilling and marking process. All of these solutions are complemented by ‘Replica’ an intelligent integration mechanism that connects the nesting and machining processes to a company´s systems management environment. The new ‘Replica’ integration mechanisms, in the latest version of the software, increase the options available for connecting the management, design and production processes of sheet metal companies, and will multiply the current and future capacity of these systems. ‘Replica’ offers several machine integration solutions, including ‘Masterlink’. This mechanism connects the CAD/CAM systems with the company management system through the exchange of XML, DWG/DXF, SAT, IGES and STEP files. One of its key advantages is its versatility, as it allows users to choose which systems and modules to integrate at a timescale tailored to suit each individual customer. "We have incorporated new options in the data importing and exporting processes so that companies can achieve maximum performance, be more efficient, ensure the quality of their products, and gain a competitive advantage", explains Lantek. In addition to ‘Masterlink’, the latest version provides new XML importers for holes in tubes and drilled holes in profiles, as well as a new technology table importer. The new version also provides increased compatibility for exchanging CNC programme data through integration with the machine, as well as significant improvements in the DWG/DXF importers. These now recognise grooves in profiles, the orientation of profiles with edges and, in DXF, have the ability to exchange geometric sheet profile files. The optimisation of the data capturing processes in the manufacturing plant has also been improved by Lantek for this version. Included is a new, easy-to-use touchscreen interface for the Lantek Wos validation and control system which allows for better flexibility and adaptation, providing interactive communication with managers or between operators. Thanks to the powerful ‘AvantiaServices’ API, an operator can validate a complete order, a specific manufacturing order, or perform partial validations, for one or several operations. With ‘AvantiaServices’, the company can synchronise data in real time, even on mobile devices. Innovation, the ability to adapt its software solutions to new technology launched by machine manufacturers, together with specialised knowledge of industry requirements, are some of the founding principles of Lantek. These distinguishing principles have enabled Lantek to become an international leader at the forefront of technology for the sheet metal, structural steel and machine tool industry. Today, the company´s R&D capabilities are clearly demonstrated through its innovative calculation algorithms, ergonomic working interfaces, and in its capacity for connection and integration with all types of software systems within the industries it serves. Lantek is a leading global multinational in the development and commercialisation of software solutions for the sheet metal and structural steel industry. Its capacity for innovation and its firm commitment to internationalisation and the development of emerging markets has led Lantek, founded in 1986 in the Basque Country and with head offices in Vitoria-Gasteiz (Spain), to become a global reference in the industry with its CAD/CAM/MES/ERP solutions. Today, the company has over 12,000 clients in more than 100 countries, offices in 15 countries, and a wide network of distributors providing worldwide coverage. In 2012 its international operations provided 85% of its turnover.